Tea tree oil is one of my go to essential oils for all sorts of household and personal care uses. Since I don't use any toxic chemicals in my home (to clean or to wash myself with), I appreciate the natural alternatives. 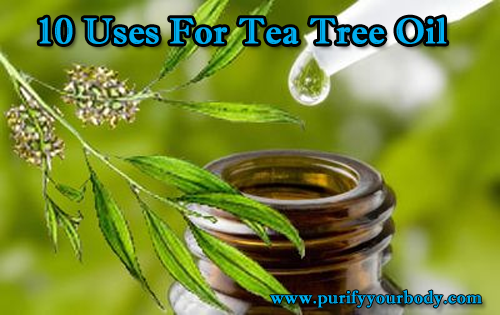 Tea tree oil, also known as melaleuca, is an antiseptic and anti-microbial, making it great for so many things. 1. Cleaning my house. I have a spray bottle mixed with water and vinegar. I add tea tree oil to it and use it for cleaning surfaces and windows. 2. Face / pimples and blemishes. Thank goodness those teenage years are over with, but every now and again I get a blemish that I want to get rid of. I dab a drop of tea tree oil directly onto the problem area. Tea tree and lavender essential oils are the only ones that are ok to use undiluted. But it is still recommended to use them mixed with a carrier oil, such as coconut oil. 3. Cleaning wounds. I have made a spray bottle with water and tea tree oil and sprayed it on cuts and scrapes to disinfect them. Never have any of them ever got infected after using this method. 4. Making toothpaste. I use a bentonite clay toothpaste recipe, and make it homemade. It consists of hot water, bentonite clay, stevia, sea salt and essential oils. I usually use a mixture of tea tree oil and peppermint. 5. Diffusing when sick. Tea tree oil is sort of like the all purpose oil to diffuse when you and your family are sick. If you have a myriad of symptoms but don't know what oil is best for what symptom, use tea tree! 6. Put in my shampoo. Well I should say my husband's shampoo, as he has dandruff and sometimes gets psoriasis patches on his scalp. You can mix it in with any shampoo you use. Just put some shampoo on your hand and then a few drops of tea tree, mix it up and use on your head! 7. Athlete's Foot / Fungus / Ringworm. This stuff just ROCKS against fungal infections. I would recommend using it with Miracle II neutralizer gel, and rubbing it on the affected area three times per day. It should provide relief within a day, but continue using it for a couple days after the symptoms are gone. 8. Cold sores / shingles. I don't get cold sores but I do get shingles outbreaks due to a low immune system. When I start to feel shingles coming on, I put tea tree oil on the nerve band that is affected, even before the blisters start to appear. I have had a few times where they have not appeared at all, and I like to think it had to do with the tea tree oil. I am one of the unlucky people who gets shingles outbreaks sometimes twice per year! Since my early 20s I have had about 17 outbreaks. It is no fun. 9. Mosquito bites. Between tea tree oil and lavender, you have yourself a winner in the department of "make that itching go away" after a day at the lake or outside in a swarm of mosquitoes. I do not know if it works on bee stings or other insect bites, as I have not tried it for anything but mosquitoes. 10. Yeast infections. This may be a too much information bit, but many women experience vaginal yeast infections. It is a fact of life. And they are so uncomfortable. One thing that works extremely well is to rub a mixture of the Miracle II neutralizer gel and tea tree oil on a tampon and insert it. You can also use that mixture externally. This is a method of treating a yeast infection that works SO well, and is all natural. Of course, chronic yeast infections are a sign of a deeper issue and this is just treating the symptoms. So many things to do with tea tree oil. It is a must to have in your home medicine cabinet. The Apothecary Extracts brand of 100% pure Australian tea tree oil comes in a 4oz bottle that can easily last over a year, even with constant use. It is around $25 and is a great value. Tart Cherry Juice for Insomnia? Bully Sticks for my Boxer!